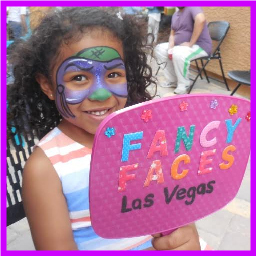 Hello, my name is Ann and I am excited to make your party a BIG HIT through Face Painting! Ann’s main goal is to ensure your event becomes a cherished memory for you and your guests. Corporate or Kid’s – any event wherever you need a smile, Ann can put it there! central Las Vegas and beyond but for an extra travel fee may apply. We also offer Glitter Tattoos and Waterproof facepaint and only use FDA compliant professional brand paints and cosmetic grade glitters that are safe for application on the skin. © Copyright Find Face Painting All Rights Reserved.